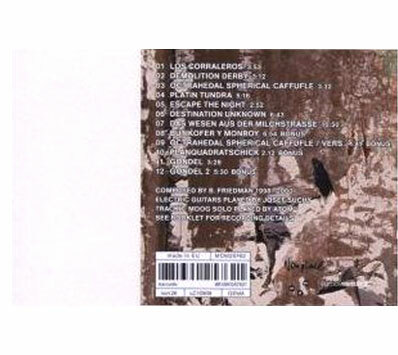 The first Nonplace CD, "Con Ritmo", originally released in 2000, remastered, edited and redesigned - it contains 4 extra tracks from the late 90s electronic jazz-dub production period... Strongly advised if you haven't heard it!! Notes : 4 extra tracks are added to this reissue of the first Nonplace CD, that has been originally released nine years ago. The music ventures into digital-age lounge music (one track features an astonishing Moog solo by Senor Coconut aka Atom Heart) and the dub-scapes that Burnt Friedman has charted as Nonplace Urban Field. "Con Ritmo" captures the subtleties and complexities of a latin flavoured live performance without descending into mere digital imitation. Friedman likes to play with notions of live, sampled and programmed material, but he also uses the capabilities of digital technology to produce edits, breaks and rhythmic matrices that even Tony Williams might think twice about attempting. It eases you into the comfortable notes without ever meandering into smooth or avant garde territory. The actual album contains track edits, overdubs, new mastering, new design and packaging. 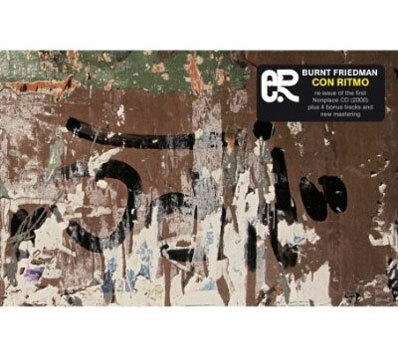 Con Ritmo captures the subtleties and complexities of a latin flavoured live performance without descending into mere digital imitation. Friedman likes to play with notions of live, sampled and programmed material. For this groundbreaking project head honcho BURNT FRIEDMAN was joined by the DISPOSABLE RHYTHM SECTION. BF himself handled keyboard & vibraphone activity while new face and six stringed surprise JOSEF SUCHY from Cologne dealt to the electric guitars. BERNIE THE BOLT was coaxed from his Sd-Amerikaine Sound Laboratoria to rattle the pots and pans and also presented his latest technological breakthrough in the form of Humphrey X-34. This so called "bass-bot" has been the main project at the Laboratoria since Bolts work on the Nu Dub Players project (see ~scape 004). To say that this interactive, humanised, instinctualised and improvisional real-time bass man/machine could revolutionise the manky world of MIDI miserabilism is not to overstate the case. Representatives of slop audio companies like Woeland, Toss, Slack-eye and Pro-Fools could be seen skulking around in corners at performances towards the end of the tour longingly eyeing up the prototype Humphrey as it unleashed lick after lick of syncopated improvised bass action. Youthful percussionist Nico "Nuez" Pulsilamo is a graduate of Bolts rhythm school while long time sonic contemporary ATOM HEART joined the outfit for one final night of probing pampaphonics on the final date of the tour in front of a bawdy crowd of seafarers at Punta Arenas notorious Taverna Del Muelle. "Das Wesen Aus Der Milchstrasse" the only track that the general public were deemed ready to hear from this unique tension charged gig contains El Atomo Corazon at his mmmmmmMoogiest, enjoy. The tinkle of ice cubes on glass, the massage of music in the stereo all marinated with first class, premier, top shelf vibes. Turn down the world and tune in to the Con Ritmo vibration.